Ships Monday, April 22 if ordered in the next 2 days, 9 hours and 1 minutes! 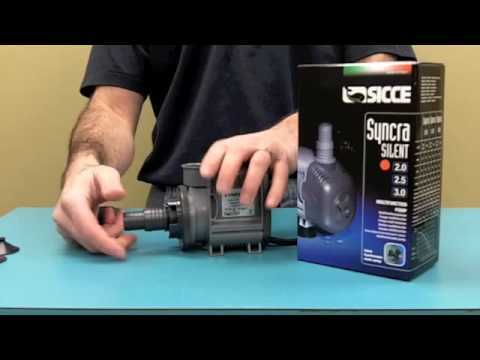 Thanks to of 35 years of experience, Sicce`s Syncra Silent pumps are equipped with a synchronous motor and an advanced rotor which makes the pumps 100% silent. International patents and extensive research and development insure all Sicce pumps are state of the art for efficiency and performance. A new range of pumps which ensure high energy savings, quiet operation, ergonomic design, powerful performance, resistance to harsh conditions, and are reliable. Syncra Silent, with their innovative technology, are versatile with a range uses. They are ideal for fresh and salt water aquariums, protein skimmers, calcium reactors, indoor & outdoor fountains, water-cooling and all submersible and inline applications which require high performance and total silence. - Speed is independent of the load, providing an adequate field current is applied. - Accurate control in speed and position using open loop controls is possible. Their power factor can be adjusted to unity by using a proper field current relative to the load. A capacitive power factor, (current phase leads voltage phase), can be obtained by increasing this current slightly, which can help achieve a better power factor correction. - Their construction allows for increased electrical efficiency when a low speed is required. - Programmable Controls are made possible for automatic speed regulation. This pump will move the water from your sump/refugium to your display tank and it os super quiet. You could be in the room with everything off and you stoll won't hear this pump working. Only bad thing about this pump are the suction cup feet. They will hold onto what you are attaching it too (bottom of the tank). But the notches on the side of the pump where the rubber feet are could jave been designed better. Will buy another pump for other tank soon. Nothing but THUMBS UP for both Aquacave's prompt, quick & easy transaction & Sicce's AWESOME product in the 2.0 model ! My display is located in a quiet, front room of my home. A quiet operation is mandnatory is a room such as this. And Sicce's 2.0 pumps operation is 2nd to none , to me. I read reviews on this product to make my decision. And Aquacave provided one of the best prices for it with shipping costs added. So glad I went with Aquacave on this deal !!!! The product arrived suprisingly quick (just days after the order was placed !) and was packaged nicely & was exactly as expected.